Oh, Mandarin Beijing, I love your food. And we come here a LOT. Mainly because it is closer to us than Golden Chopsticks or Golden House, two of my other favorite Chinese restaurants. 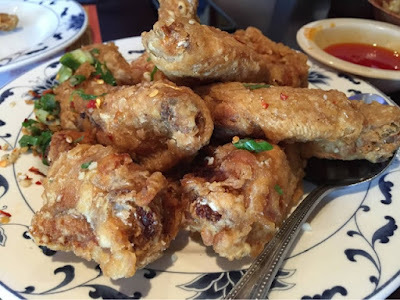 Plus, if you do not know about salt & pepper chicken wings yet, you have to get to know them. They are so delicious that I do not know anyone who does not like them (besides the non-meat eaters, of course). Yeah, I know. They serve Thai tea ($3.50) here and it is really, REALLY good. It has the perfect sweetness, creaminess from the condensed milk, and tea flavor. 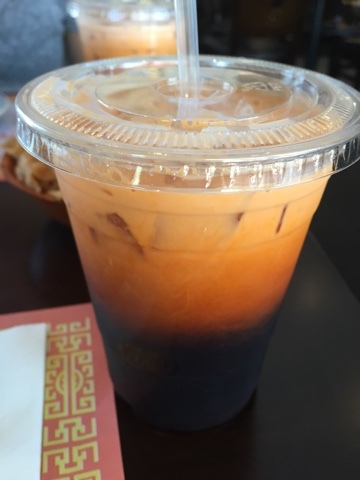 It is hard to pass up getting a Thai tea to go after we eat (my usual ritual - it's like dessert to me). Now... who cannot resist awesome lunch specials? Lunch specials from Chinese restaurants are the best because the portions are huge and the cost is low (and awesome). Here at Mandarin Beijing, they have the combination plate lunch specials ($5.95) and the "lunch size" entrees ($6.95). 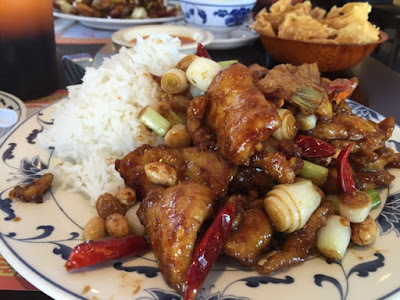 I ordered the Kung Pao Chicken lunch special ($5.95), which comes with a cup of egg drop or hot and sour soup, fried or steamed rice and an egg roll. The egg drop soup is simple goodness. 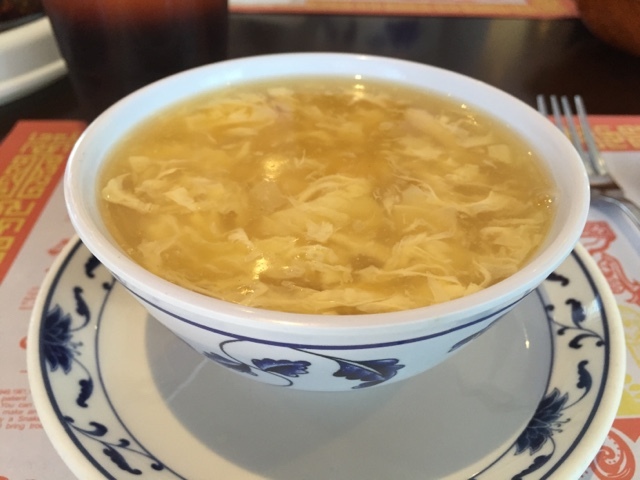 The broth is thick, creamy and comes out steaming hot. The egg has a cloud-like, wispy, soft texture and is yummy. You can also add some complimentary fried won ton chips for more texture. It may not look like it is, but this is a regular sized dinner plate and the food is piled on it. It is so much food that technically you can share with someone and ordering an additional cup of soup or appetizer like the delicious Chinese bbq pork (char-siu) would be perfect combination for lunch. Yup, during this trip, I was hungry, so I ordered my own (sharing, what's that?). Mandarin Beijing's kung pao chicken is SO GOOD. For some reason, the sauce tastes sweet and savory to me. It is not too sweet, because I highly doubt they put sugar in the recipe. It just has a nice flavoring that is addicting and deliciously different to me. It is not spicy at all. The presence of the chili makes it seem like it is, but it is not. I always make a forkful of chicken, scallion, a peanut and some steamed rice. YUM. And of course, I only ate half of it. My husband ate my leftovers so he was happy. Our lunch special also come with egg rolls, which was given to us while I was devouring my kung pao chicken so I missed the photo opportunity for those. They were filled with vegetables and was made fresh for us. Lastly, what I mentioned at the beginning of the post.... the famous Salt & Pepper Wings ($6.95) lunch entree size. I am not sure if this is local San Diego thing only. I mean, if it were a thing in Los Angeles, etc. I would think I would see a whole tray of these at our family parties up north. NOPE. Nothing. When we host parties here in San Diego, we always get a large tray of these delights, every single time. They are always crispy and tossed in crushed red peppers, scallions and garlic. I always take this scallion mixture and add it to my steamed rice. Oh, yeah. Never let them go to waste! The lunch entrees come with the steamed or fried rice and a cup of soup. These portions are smaller and are about a $2.00 difference from the regular price. Tips: A lot of people go for their take out. Your order may or may not be ready when you arrive. Please be patient. Order when they first open (11am) and not during the weekend rush lunch time service (guessing 12-1pm), prime time dinner service (guessing 6-7:30pm), and holidays. Weekdays and weeknights are always chill and not busy at all.